Whether by email, phone or in person, help desks across the UW are focusing on the customer experience. In the photo, UW-IT customer specialist Omari Stringer helps fellow student Kate Cormier to connect to eduroam, the UW’s encrypted Wi-Fi network. Ranked as one of the premier business schools in the nation, the UW’s Foster School of Business knows a great deal about customer service and the power of a well-run help desk. So when Foster sought to increase the capacity and responsiveness of its various help desks, and offer 24/7 support for students, faculty and staff, it jumped at the chance to participate in a UW-IT pilot program that promised to do just that. Last winter, UW-IT unveiled its Enterprise Service Desk (ESD), a new for-fee service available to existing customers of UW Connect, a service management tool built on the ServiceNow platform. UW Connect has been configured for the University, allowing multiple units and departments to manage and deliver their own customer-focused services. And because UW Connect offers a common system to deliver support, it now allows UW-IT to seamlessly provide the ESD service. When a departmental help desk is unavailable, the ESD steps in, and provides the same single point of contact for email, telephone calls, and routing of customer requests. It’s what customers are used to, and now they get that same service 24 hours a day, seven days a week. 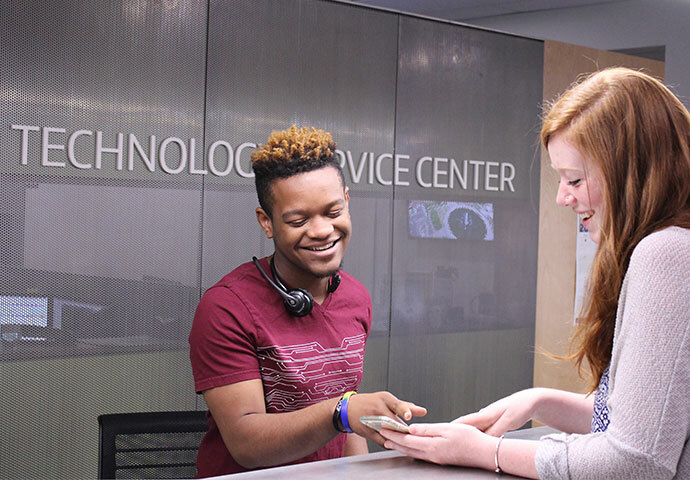 The Enterprise Service Desk is an outgrowth of continuing efforts to improve the customer experience delivered by multiple IT help desks on all University campuses and at other UW locations. This is no small feat, as the UW is larger in population on any given day than many small cities, with tens of thousands of calls for help coming in each quarter. Years ago, with less robust tools and fewer ties among service desks across the UW, the customer experience was not as consistent as it is now. As the central IT organization for the UW, UW-IT has led efforts to strengthen the partnerships between central and decentralized IT so everyone can provide a smoother, more seamless customer experience for the entire UW. About four years ago, these efforts led to the implementation of UW Connect, a unified, automated system for accessing and delivering customer support. UW Connect has been configured to allow any department or unit to implement it for their own use. Foster and about a dozen other departments rely on the tool to help their customers; these include Facilities Services, Center for Shared Services, Integrated Service Center, and soon UW Bothell. At its heart, the UW Connect tool provides a single system of record for tracking and managing service requests, including whether a customer issue has been resolved. It allows a help desk to organize and prioritize work, automatically create records and route inbound emails to a particular group. It is also rich in metrics tools that allow departments to track how they’re doing, and where they need improvement. UW Connect is based on the ITIL service management framework, a common set of IT best practices. It has allowed departments to speak the same vocabulary, follow similar processes, and deliver better and more seamless services. In the growing arsenal of service tools, ESD now allows UW-IT staff to step in, akin to a pinch hitter, when a department can’t answer a call or email. The pilot also refined the ESD service, which is now offered to all UW departments and units that are currently subscribed to UW Connect. ESD comes with a lot of flexibility. It provides customers with the option of fulfilling overflow work, after-hours work, or taking on all the email and phone support for departmental help desks. Foster’s growth has challenged its various help desks, with an increase in the number of calls and emails from students, faculty and staff. That’s why about a year ago, they started looking at ways to meet the demand. 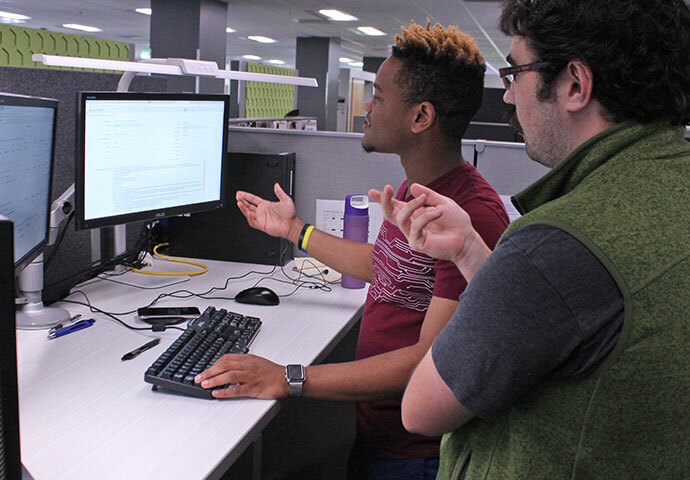 UW-IT Enterprise Service Desk specialists Omari Stringer and Colin McCarthy discuss how best to handle a request for help that had just been routed from the Foster School of Business. Balaz said the trial by fire for the new service came recently, when a faculty member had problems with classroom equipment at 7 a.m. on a Saturday. In the past, a call would have gone to voicemail because there isn’t any Foster help desk coverage over the weekend. This time, a UW-IT customer specialist picked up the call. There was an added bonus to the pilot, Balaz said. Their partnership with UW-IT lives up to the idea of one University. UW Connect was created to improve the customer experience. Read how the Enterprise Service Desk can help. Learn more about collaborations at the UW and how UW-IT contributes. Check out how UW-IT will collaborate with partners in 2019 for a better UW.